Want to skip to the results? View the Business Momentum website HERE. Business Momentum provide executive coaching and team consulting for business leaders. With impressive results, a large client base and over 17 years of experience, it was time for a website upgrade. Business Momentum’s website had badly structured URLs, no work completed around SEO and didn’t work on mobile. All of which are easy wins in our eyes! The brief came to us through our digital partners, Gripped. Gripped is an inbound marketing agency out of London, who have worked with some amazing clients, delivering exceptional inbound campaigns, digital solutions, and brand messaging projects. This was one of many collaborations with Gripped (examples include Timico & Chronicle Software). With an almost blank canvas to work from, we worked together with Gripped to plan and map out the website’s core structure. From there, we were able to create initial mock-ups, which once approved, were used to inspire a consistent design across the website. Because we were working with an existing domain, with organic traffic already coming to it, we need to have a redirect plan in place. This ensured that all users that currently accessed the site would not be disrupted. Instead, they would be pointed to the most relevant content on the new website, as not all of the existing pages were going to be carried over. Gripped worked on all of the content across the site, and once in place, Affios went through and tidied up the website. 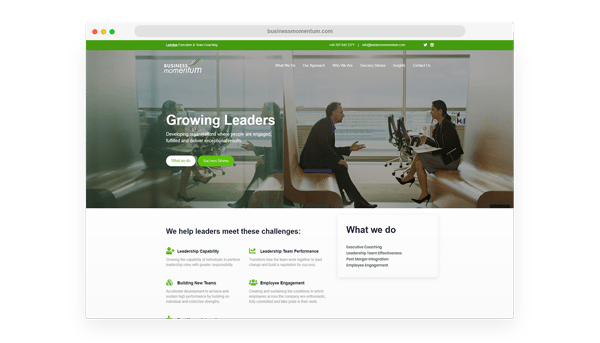 Now launched, the Business Momentum website is search optimised, mobile optimised and carries a fresh design to help drive new clients. Gripped has continued to provide inbound support and implementation, and Affios has supported with ongoing site maintenance. To view the Business Momentum website, just click HERE.